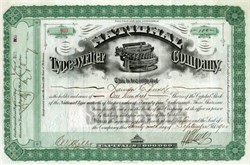 Beautifully engraved certificate from the National Type-writer Company issued in 1900. 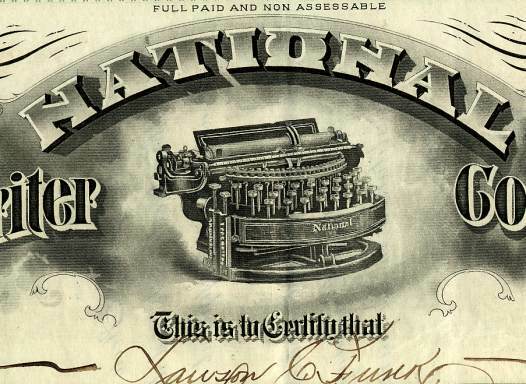 This historic document was printed by the Security Banknote Company and has an ornate border around it with a vignette of an early National Typewriter. This item is handsigned by the Company’s President ( Henry Unz ) and its Treasurer. This is only the second time we have had this certificate for sale. The company was incorporated in 1899 and was headquartered in Philadelphia, Pennsylvania. The National typewriter was a compact design by inventor Henry Harmon Unz was produced so the entire keyboard and type basket could be removed from the machine for repairs. The National was an upstrike typewriter with a double shift. The shift key moved the entire keyboard and type basket forward, while the carriage stayed in place. Other features included an upstroke type action with ribbon inking, a curved keyboard and elaborate gold scroll.